Carte de L'Amerique Septentrionale dresse ET dessinee sous laDirection de Mr. J. G. Barbie du Bocage. 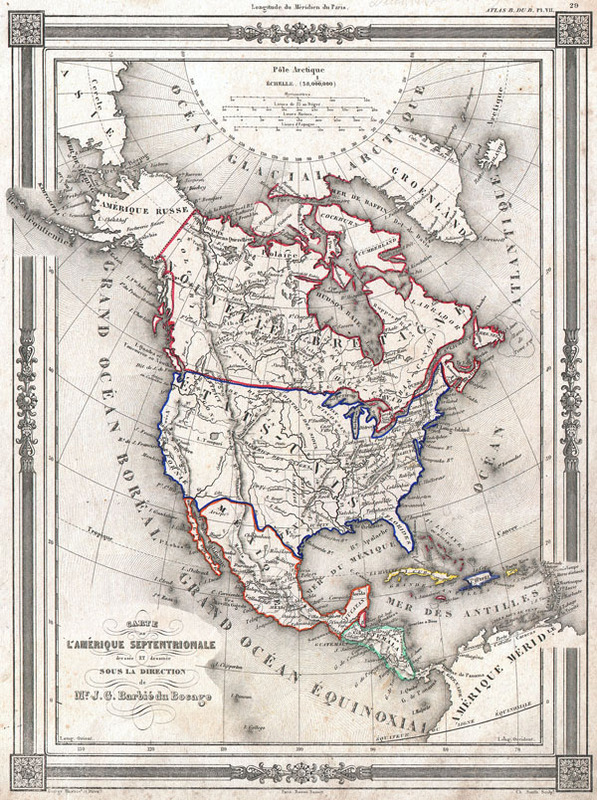 An uncommon and extremely attractive 1852 map of North America by J. G. Barbie du Bocage. Depicts all of North America from the Arctic Circle to the northern part of South America. The United States is shown shortly after the acquisition of Texas and Upper California though pre-Gadsden Purchase. Texas border is faint but the state is shown at its fullest extent. Names numerous American Indian tribes including the Osages, Sioux and the Mandan. The Great Salt Lake appears as Lake Tampari. Mt. Jefferson, Mt. Sampson, Mt. Long, Mt. James and Mt. Smith are all labeled. Features a beautiful frame style border. Prepared by J. G. Barbie du Bocage for publication as plate no. 29 in Maison Basset's 1852 edition of the Atlas Illustre. Very good condition. Some marginal foxing, else clean. Blank on verso.